The same elements of design are there whatever the scale; there is only a difference of degree not pattern. 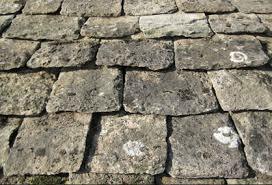 The Oolitic Limestone found in the Cotswolds has been used for centuries. The local Quarrymen and Masons enjoyed working on buildings that they could point to afterwards with real pride. Often small terraces of cottages were shoehorned on to narrow shelves on steep hillsdes. Manor Houses normally had more land to be built on. These are prepared in the stone quarries and are split down fault lines. Larger slates are put on the bottom of roofs, the slates are graduated up the roof so the smallest ones are at the top. 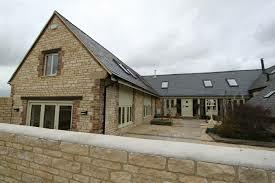 Steep pitched roofs are characteristic of Cotswold builkdings and facilitates heavy volumes of water to run away quickly. This prevents the slates becoming saturated and stops damp penetrating to the rooms below. They are another distinctive feature of the Cotswolds. The gable at the end of the house abutted the Chimney Stack that often rises in diminishing courses. Often projecting porches were added; these were small rooms in their own right with a small loft above it having its own gable. The height of walls of smaller houses and cottages was about fifteen feet, so the upper story was only about five feet or so at the eaves, leaving little room for windows. A solution was found by carrying the wall into miniature gables or ‘gablets’,into which windows were inserted, letting air and light into the attics. Fireplace was about six feet, the height four to five feet, and the large flues tapered to the roof. 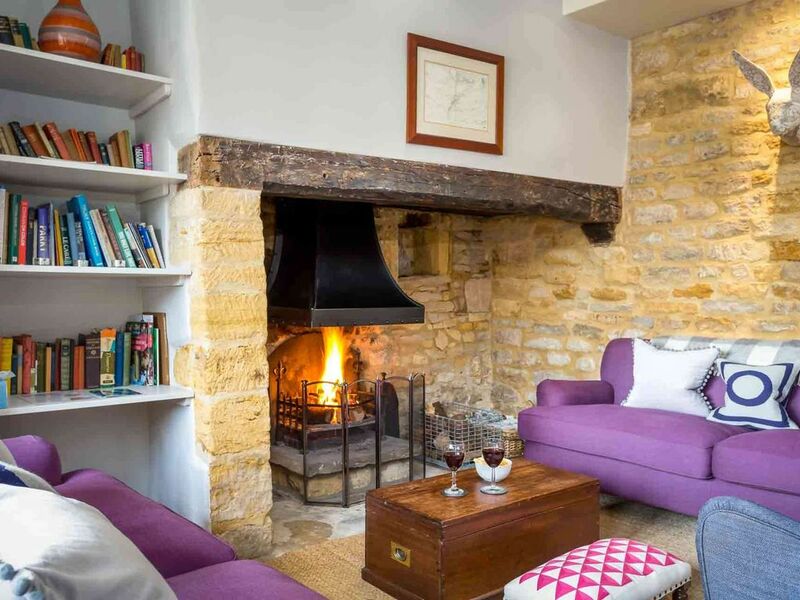 A fireplace had stone jambs(sides) and an immense oak beam. On one or both sides of the fireplace a seat, just wide enough to sit on, was often placed in the thickness of the masonry with an arch above giving room for the head. By the beginning of the eighteenth century the arched entrance with moulded jambs, frieze and cornice had become well established for the better class house, ranging from the manor house to those of the yeoman farmer, merchants and prosperous tradesmen. The door- hood took many forms , from the heavy slab of stone supported by carved stone brackets to the sharp-pointed arch like a miniature roof ridge decorated with heavy mouldings and raised on an elaborate convoluted console bracket.